Your business relies on a constant stream of power to energize your equipment, safety systems and computer network. It’s crucial to equip your facilities with power systems that provide reliable back-up and a seamless transfer of power when and if utility energy is not available. That’s why you should consider purchasing power system equipment from Michigan CAT. We offer a wide range of power system solutions that will provide your company with rock-solid dependability and an uninterrupted transfer of power when you need it the most. Generator sets: Both gas and diesel generators are available through Michigan CAT in a variety of sizes. Whether you’re in need of a fleet of generators for a new facility or need to replace a failing unit, we can equip you with a model that will suit your needs. Transfer switches and parallel switchgear: Power outages are often unexpected occurrences, leaving you with no time to power up your generation equipment. Transfer switches and parallel switchgear can detect an outage and automatically switch your power system over to your back-up power generators. Michigan CAT offers a variety of models to suit your company’s individual needs, whether you need one unit or a series of switches to build out your system. UPS systems: Powered by a battery or flywheel, UPS (uninterruptable power supply) systems provide power to your equipment in the moments immediately after a power outage. They’re a great choice for your company’s computer systems, protecting against data loss and damage caused by power outages. Michigan CAT offers a selection of different UPS models for all different kinds of backup power needs. Need a Backup Power System Solution for Your Business? Contact Michigan CAT Today! 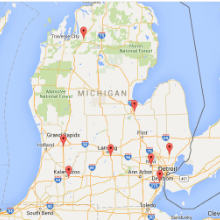 Contact Michigan CAT today if you’re in need of power system equipment for your Michigan company. Our friendly, knowledgeable staff will work with you to determine which machines will best suit your needs.